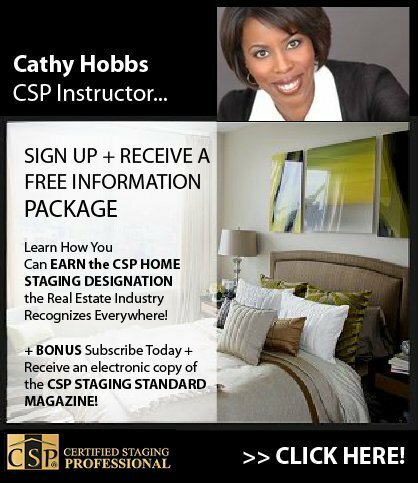 HOME STAGING COURSES: CELEBRITY INTERIOR DESIGNER & HOME STAGER CATHY HOBBS OF HGTV DESIGN STAR ANNOUNCES HER REMAINING HOME STAGING COURSES FOR 2011! ≈ Comments Off on HOME STAGING COURSES: CELEBRITY INTERIOR DESIGNER & HOME STAGER CATHY HOBBS OF HGTV DESIGN STAR ANNOUNCES HER REMAINING HOME STAGING COURSES FOR 2011! As we wind down 2011 and look to the future and 2012, there are only a few opportunities left to take one of my Home Staging Courses taught through CERTIFIED STAGING PROFESSIONALS (CSP). What better way to kick off the New Year than to be certified as a home stager and begin your business as a Certified Staging Professional! Here are the remaining cities and dates for 2011. Be sure to also find my full schedule at http://homestagertraining.wordpress.com or http://www.stagingtraining.com. CLICK BELOW TO RECEIVE A FREE INFORMATION PACKAGE! It’s almost time! I am so excited to be returning to the Washington, D.C. area where I was a reporter for NBC WRC-TV from 1994-1997. I am thrilled to be teaching the prestigious Certified Staging Professionals course, training aspiring stagers on the skills necessary to start, build and grow their businesses. 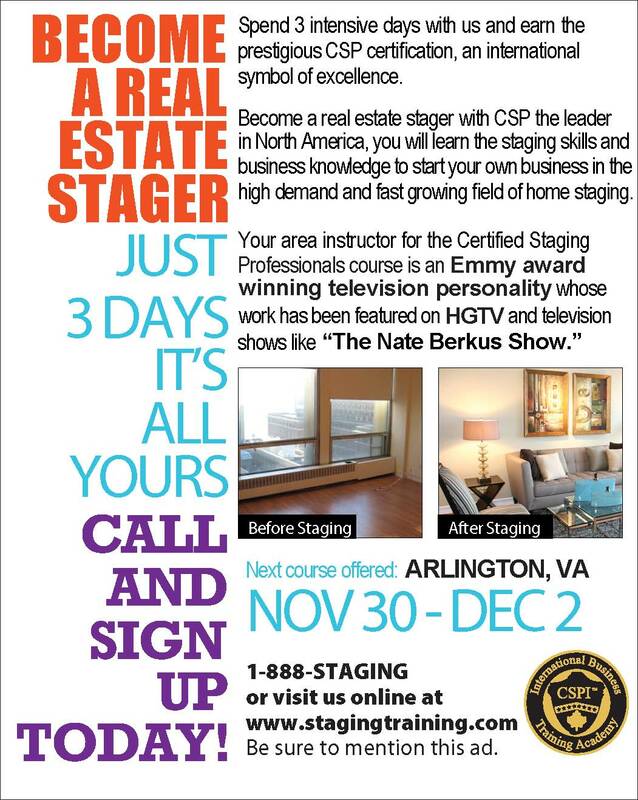 Here are the details for the upcoming Arlington, Virginia course (just over the bridge from Georgetown), it’s not too late to sign up .. you can learn more by calling 888-STAGING. Stage! Shoot! Sell! When it comes to selling real estate, photography can seal or sink a deal. The reality is that the vast majority of potential buyers first discover a property through the internet. It is also true that photography is what prompts potential buyers to want to see a property in person. 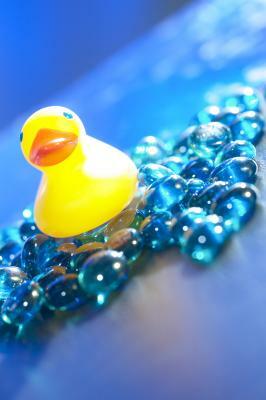 My goodie bag consists of some of the “tricks of the trade” that I use when staging for photography. At the top of my list is always incorporating a beautiful floral arrangement to use as a centerpiece on a table, dining room console, bedside table, or bathroom countertop. My arrangements of choice—and I am truly giving away one of my best-kept secrets here—are luxurious artificial floral arrangements from Diane James (www.dianejameshome.com). What makes these arrangements a must-have, whether it’s for staging or decorating in general, is how incredibly real they look and the vibrancy of color and texture they add to a space. Other must-have items in my grab bag include decorative toss pillows in several different colors, a neutral-colored throw, a white sheet, neutral-colored shower curtain, a simple vase, and tray. While my bag is brimming, these are some of my essential tools that any homeowner can keep in their “bag of tricks” when it comes time to sell their own home. A white sheet will come in handy as a potential quick slipcover over an armchair or loveseat. Toss pillows in rich, deep colors will add an instant sense of freshness and warmth. Solid jewel or warm tones are best. A home seller will always be able to find a home for a neutral-colored throw, whether it is on a sofa, settee, chair, or ottoman. And nothing neutralizes and adds luxury to a bathroom quite like thick, plush towels, paired with a neutral and inviting shower curtain. “Lifestyle” elements and accessories such as a modern vase and tray will help complete the look. Professional photographers charge $500–$3,000 a day, and while the cost is usually assumed by the real estate brokerage, it is still possible with a good quality SLR camera for a savvy home seller to photograph a property themselves. Five-time Emmy award-winning television personality Cathy Hobbs is the founder of Cathy Hobbs Design Recipes™, a New York City-based firm specializing in interior design and home staging. A nationally known design expert, Cathy was a finalist on eason 6 of HGTV’s hit reality series Design Star. Cathy is currently traveling around the country as an instructor for Certified Staging Professionals, teaching their prestigious 3-day certification course. www.cathyhobbs.com.